"Oh Mum. Why can't I go outside to play with the other children?" whined Sally Applebarrel. "You know why, dear. Besides, Dr Twigg is coming to see you any minute. Now run along and get washed up, like a good little girl." Sally huffed and puffed, but it didn't do any good, so she finally wandered off to get cleaned up before their visitor arrived. 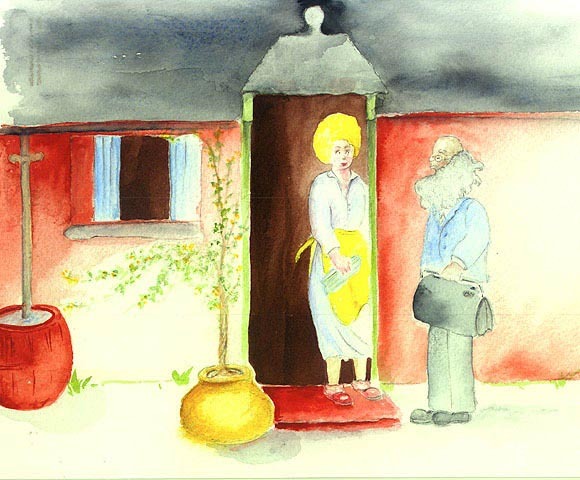 "Good morning Doctor Twigg," Sally's mum greeted the doctor as she swung open the door. "How are you?" The Doctor's face was covered in the largest bushiest beard anybody had ever seen. Little Sally hadn't been feeling well for months and months, and although Doctor Twigg had been visiting Sally almost daily, always bringing with him the latest medicines, he hadn't yet been able to find a cure for Sallly's mystery illness. 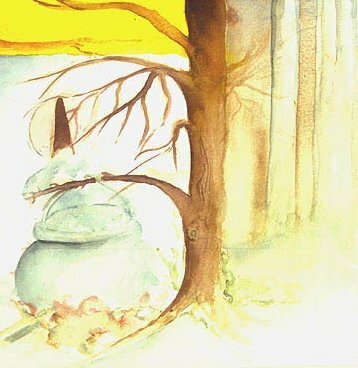 "Good morning to you, Mrs Applebarrel," said Dr. Twigg. "And how are you this fine day?" Sally peeked around the corner. "Ah, good morning Sally," said Dr. Twigg, beaming a great big smile in her direction. "Are you feeling well today, young lady?" "I'm just a little bit tired Doctor. But I would like to go outside and play with my friends. Please tell my Mummy it would be alright," pleaded Sally. "Very well Sally, tell your mother I said you may, but on one condition. Stay away from Black Heart forest." Black Heart forest was dark and spooky and strange things had been known to happen there. Sally wasn't well and Dr. Twigg didn't want her exposed to anything that might place her in danger. His warning expressed his concern for his favourite little patient. "Alright, I promise, Dr. Twigg," agreed Sally. "Mummy, I'm going out to play, smiled Sally. "Doctor Twigg says I can. I'll be back home in time for supper," and with that, a happy Sally dashed out the door, off to meet her friends, Mary and Saul, the local Blacksmith's children. Mary and her little brother Saul were regular visitors to Black Heart forest. The pair loved playing tag in the shadows of the tall dark trees. "Come on Sally, let's play hide and seek!" yelled Mary, and the three of them scampered off. Suddenly Sally stopped. "Wait!" she cried. "I can't go into that spooky old forest. Ive promised my Mum and Doctor Twigg." At that Saul began to dance around Sally, taunting her with "Scaredy-cat, Scaredy-cat." "Who's a scaredy, scaredy cat then?" asked Mary with a sniff. "There's nothing to be afraid of, Sally. We've never seen anything spooky, have we Saul?" Saul started to shake his head then paused. "Well...there is that strange old woman who lives in the cottage down by the stream. But its not that spooky..." Still, Saul shuddered ever so slightly when Sally wasnt watching. In truth, she was sort of spooky. The old woman always dressed in black and was thought to live all alone. For years most of the villagers had privately referred to her as a witch, but not one of them was interested in venturing into the forest to find out if she really was or not. "What could be so spooky about an old lady's cottage?" asked Sally curiously. "Well," said Saul pausing briefly, "It's got a large black cauldron outside which bubbles away night and day." "It smells horrible too," added Mary. And just like that...Doctor Twiggs warning was forgotten. Sally's mind was now racing with excitement as they wandered deeper and deeper into the woods. 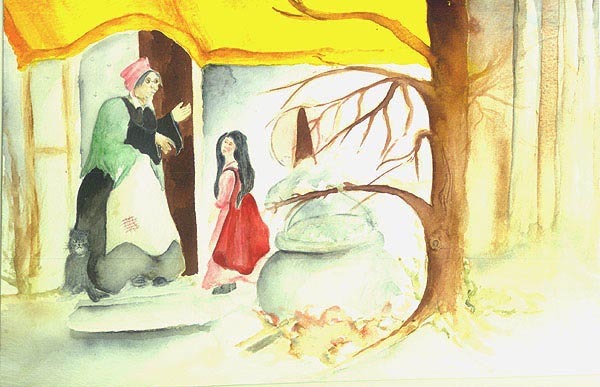 She wanted to see the cauldron and the cottage, and the old woman who lived there. "Ive just remembered something," Sally told Mary. "I must be home in time for supper, I've promised my Mum. Its funny how she remembered that part of her promise. She had certainly forgotten all about Dr. Twigg's warning. The three children ran through the forest. After a while Mary stopped. "I'm thirsty," she said. "Lets go down to the stream near the cottage so I can get a drink of water." This was Sally's chance to see the old woman's cottage for herself. And sure enough, just across the stream, the old thatched cottage came into view. It had small round windows, an iron studded front door, and a large cauldron was busily bubbling away in the front garden. As her friends were drinking Sally carefully made her way over a old rickety bridge and edged towards the small untidy garden near the front door. Suddenly the cottage door burst open and out ran a little girl, followed closely by a small black kitten. The little girl caught sight of Sally and stopped in her tracks. "Hello!" she said curiously. "Who are you?" Sally was surprised at how nice she seemed. "Hello," Sally replied. "My name is Sally Applebarrel. I'm from the village. Thats a nice kitten you have there? May I stroke him please?" asked Sally. "No," snapped the little girl with a frown. "He'll scratch you. He doesn't like strangers." But then the little girl stopped frowning. "How old are you Sally Appletree?" she asked curiously. Sally began to giggle. "You've got my name wrong, its not Appletree, it's Applebarrel. And I'm eleven years old. How old are you?" "I'm eleven too" said the little girl. "But only for two more days after today, and then it'll be my birthday. I'm having a birthday party," she sniffed, "but you can't come, because only other witches are invited." Sally stood there quite silently for a moment wondering whether she had heard the little girl correctly, then looked around nervously to see where her friends were. "Uhh.... did you say witches?" she asked. The little girl began to say some magic words and Sally became rather frightened. She turned around and began to run. Sally wasn't about to stay behind to find out what those strange words the little witch had begun chanting actually meant. Sally dashed across the bridge and rejoined her friends. She whispered shakily that the little witch had said she was going to put a spell on them if they didn't leave right away, so the three of them turned and began to run as fast as they could. The little witch had definitely frightened them. When they reached the edge of the forest they stopped to catch their breath. "What a nasty rude girl she turned out to be!" grumbled Mary in a trembling voice. "Well, I hope she has a horrible birthday party," sobbed a thoroughly frightened Sally, who by now was gasping for air. The three children were still trembling when a large figure suddenly came into view, causing them to huddle together even closer. "Now what's all this, then? What have we here?" asked a booming voice which came from behind a big bushy beard. It was Doctor Twigg, and what a welcome sight he was to the children. Dr. Twigg took in the scene in an instant. Sally was pale as a ghost and she was having trouble catching her breath. "You two kids go straight home to your mother," he told Mary and Saul, "she'll have your supper ready by now. I'll take Sally with me." On the way home Doctor Twigg quizzed Sally. "You haven't gone anywhere near that old cottage in the forest, have you Sally? asked the doctor. You didn't drink any of the water from that stream? His voice was grumpy, but he was truly worried. Sally nodded. "Oh Doctor Twigg... I feel funny. My head is spinning and my legs are shaky... I don't know what's wrong with ..." but before Sally could finish her sentence she collapsed. The Doctor quickly scoooped her up in his arms and ran all the way to her house. Sally's mother put her to bed and there she lay, as still as a statue. She wasn't dead, but she didn't look really alive either. "Let her rest," said the doctor to Sally's mother. He looked very worried. He reached into his medical bag and withdrew a small bottle. "Give her this medicine if she wakes," he said. "I'll come back tomorrow to see how she is." As the doctor left the house, Sally's mum was crying silently. But Sally didn't wake up later that day, or the day after that. Very soon word started to spread around the tiny village about just how poorly little Sally was doing. "She's such a sweet little girl, her poor mother must be heartbroken," sighed Julia Gunn, the parson's wife. Her neighbor nodded. "The whole village hopes and prays that Sally gets better quickly," she agreed. The news of Sally's strange illness had even reached deep into the forest. A woodcutter, on his way to market had paused to tell an old woman and her granddaughter who lived in a cottage deep in Black Heart forest about the little girl who had collapsed at the edge of the forest. Although the grandaughter was interested in the news the old woman wasn't. She was too busy trying to explain to her granddaughter how important it was to become an evil witch, so she roughly sent the woodcutter on his way and turned to the child again. "Listen to me child," she said sharply. "There are four rules to witchdom. Rule one. Get yourself a black cat. Rule two. Always keep two broomsticks in case one breaks down. Rule three, you should look the part. Try to grow some warts and boils on your nose. Most important however, is rule four. Rule four says Never do a good spell for anybody, especially on your birthday, for to do so would mean that you and all the other witches of the forest would disappear forever." Disappear forever? The very idea sent an ice cold shiver right down the little witch's back. "Now be off with you... I've got some magic potions to brew," growled the old witch as she shooed the little girl outside, shutting the heavy door behind her. The little girl soon became very bored. "It's just no fun playing on my own," she sighed, "I wish I had some friends to play with." As she gently stroked her cat, the little witch remembered Sally and her friends. "I was very rude to that poor little girl, wasn't I Merlin? And now I've heard she's become ill, and the woodcutter said she's doing poorly. I wonder if there is anything I can do to help her?" the little witch mused, and then she began to think. "I know!" she told her cat. "I could go visit Sally. Maybe I could put a spell on her to make her well again!" but even as she thought, the warning drifted into her head. She didn't particularly want to be responsible for making all the witches of the forest disappear, now did she? But after another two hours of boredom she decided to seek out Sally Applebarrel. Even though by now it was getting late in the day, the little girl jumped onto her broomstick and flew through the forest towards the village. Once there she would see if there was anything that could be done. When she got to the village the little witch noticed that everyone was very quiet. Sally was not doing well. She wasn't doing well at all, and everybody felt terrible about it. "I must do something to help." said the little witch to herself, and headed towards Sally's house. 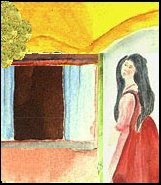 The window to Sally's bedroom was wide open. The little witch quietly climbed through the window and stood next to Sally's bed. "Sally, please wake up," she whispered. "You can come to my party, and and you can even bring as many friends as you want." But Sally just lay there, and her face against the pillow was very pale and very still. The little witch looked out the bedroom window and in the distance she saw a handful of children still running around and playing games in the moonlight, even though it was now long past eleven in the evening. Nobody in the village could sleep while Sally was so ill, neither the adults, nor the children. Children playing together had always looked so happy and carefree to the little witch. She couldn't remember ever having fun like that, even with her magic spells. In fact, the more she thought about the idea of growing up to become an evil witch, the less she liked the idea. "I don't think I'd like to be a witch anymore. It's dull and boring to have to be nasty to everybody all the time. I'd rather play and have fun like all these children do," she thought to herself. The little witch thought some more. "The thing is..." she told herself, "if I make Sally well, that would mean all the witches in the forest would disappear, including me. But if I don't try to make her better, I'll never have any friends at all. Ill just become old and lonely, and I'll end up turning the people I don't like into frogs. That's not much of a choice!" The little witch's mind was in a terrible muddle. Just then she heard Sally's mother sobbing quietly in the other room. "My little girl is dying! she wept. "What can be done to save her?" The little witch knew Sally's mother was about to come into the bedroom, so she hurriedly tiptoed over to Sally's wardrobe in the corner of the room, stepped inside, and softly pulled the cabinet door almost closed behind her. Sally's mother came into the room and sat on the edge of her daughter's bed. It was now or never for the little witch. Should she sacrifice herself to make Sally well, or leave her to her fate and become a fully-fledged evil witch? The little witch peered out through the crack in the door so she could see the clock on the mantle-piece. It was five past midnight, officially her birthday. She made her decision. She decided to say her magic spell. I'll chase the fever from your door. A gift of life with my last spell. Sally's eyes fluttered and then began to open. A tearful Mrs. Applebarrel gasped and put her hands up to her mouth. "Hello, Mummy," whispered Sally. "What are you crying for? She smiled up at her mother. "I've just had the most lovely dream. It was about a little witch who turned into a good fairy so that she could make sick children well again with her magic spells." Mrs. Applebarrel was both stunned and thrilled. She quickly sent a neighbor to fetch Dr. Twigg. When he arrived, he examined Sally and told her mother that through some miracle Sally seemed to be as fit as anyone he had ever seen. The villagers prayers had surely been answered. By morning, the news had spread through the village and beyond. Everyone was happy. A few days later, the woodcutter mentioned to some friends in the village that the inhabitants of the cottage in the forest must have moved away suddenly, because the place looked to him as if everybody had simply up and disappeared. Not long afterwards, on very starry night, Sally was lying in her bed, nearly sound asleep, when a beautiful pink light began to fill her room. "Hello, Sally." A lovely child's voice came from within the light. "Remember me? I'm the little witch you met in the forest. I wanted to help sick children so I was turned into the good fairy you dreamed of. I'm so glad that you're well again, but I have a favor to ask of you. Please find my kitten and take care of him for me. Rename him 'Lucky', Sally. I think he'll like that don't you?" But before Sally could answer the soft light began to fade away. Please, Sally? she heard. And the light slowly dimmed until it completely disappeared. I'll take care of him forever, I promise. And thank you for taking care of me, my friend, said Sally. The next day Sally went into the forest and rescued the little cat. And true to her word, she renamed him Lucky. The lucky kitten would spend the rest of his life with Sally, a constant reminder that the two of them owed their lives to a little girl who chose to put others before herself. And always would.